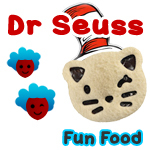 Dr. Seuss’s Birthday is tomorrow! Sandwich Woo hoo! We’re off the PB&J and today it was grilled cheese! The fish I made with a template from a print out used on sliced cheese. The eye was a flattened out piece of Marshmallow Bit(s). The fish was outlined and drawn in edible markers, as was the goldfish bowl. Sides Fuji apples and (not pictured) a mandarin.